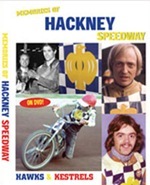 Our review of this new DVD that looks back on the career of Speedway Star's Man of the Millennium. Sebastian Jan Sojka has uncovered some more unlikely youtube clips that contain speedway related scenes. Chris Fenn is looking for two Hackney programmes from 1963 to complete his collection - Can You Help? Lyn Johnson would like a copy of Ipswich Speedway the first 50 years - Can You Help? Ewen Nicolson's Tigers at the Tapes blog has moved to a new location. It can now be found at http://tigers2011.blogspot.co.uk/. 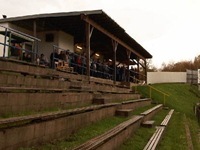 Ewen reports that a move to Friday evening racing at Ashfield may curtail his photography next season, the lack of natural light being too big an obstacle for his terracing based photography to overcome. "Tiny White ran a Douglas motor in a "modern" upright speedway frame for a time. I know he raced it at a BMF Rally but can't remember exactly when. " "BST is a great event, unfortunately the middle spectator level is now closed as the structure is unsafe. Whilst Brighton is the oldest straight line sprint still running, the old est speed event in the World still on the original course is at Shelsley Walsh in Worcestershire pre-dating Madeira Drive by just a couple of months. Nice to see a speedway machine in a different setting. Shelsley sees a couple of speedway derived machines every season one a Velocette and the other a Weslake powered AJS. Former Brummie Mike Lawrence still competes there in a speedway JAP powered Cooper and many other similarly powered cars appear. " 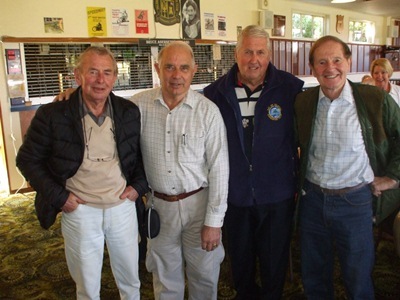 "The Boro bears started back in 1961 and I attended the odd meeting as an 11 year old, come 62 me and my friends were hooked and we attended just about every match until it closed mid 60s, after Eric Boothroyd tried to keep it going with guest riders including Barry Briggs, Olle Nygren. Ove Fundin and Peter Craven made appearances during the Provincial years to our great delight. When it reopened as a div2 outfit we didn't feel it was the same and most of us drifted away. I kept going back for odd matches and by 1981 my perseverance was rewarded with div 2 championships which was just as well because I moved with my family to Australia in 82. Fortunately I returned long enough to see the last meeting before Cleveland Park closed forever and it met the same end as the house I had lived in over the road, knocked down. I had some of the best times of my life there and I miss it to this day." "Re- aussie race tracks, can anyone tell me why there are no GB v Aussie test matches like back in the Peter Collins days? It was great to look in the Speedway Star to see what was going on, old man Crumpy, John Titman, Ron Hendo Henderson etc." "I agree with Rob Greatley about Ronnie Moore and Tommy Jannson.Both great riders.But it is my dream team. I have gone with people I enjoyed watching most." 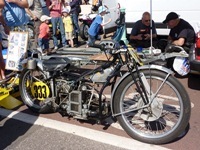 Philip Dalling recently encountered a 1928 Douglas machine on the streets of Brighton. 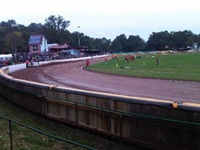 Further pictures of Gillman Speedway in Adelaide, courtesy of Graeme Frost and Dave Parker. Brian Webster wants to know about William Gordon who raced at Glasgow in the forties - Can You Help? Rachael King is relative of former rider Val Morton and would like to know more about him - Can You Help? "A big thank you to Tracy Holmes for the wonderful and extensive guide to all the World Longrack Finals. Longtrack didn't always get the coverage it possibly warranted in the UK, so Tracy's meeting-by-meeting guide really puts you right in there with a blow-by-blow account leading right up to the excitement of the final. It was also very interesting to see how the purist speedway and purist longtrack riders fared over the years. 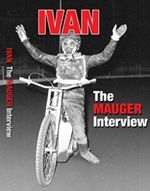 The records of Muller and Mauger were really amazing. A great little read, not to be missed!" "Thierry Hilaire was a rider who gave 110% every where he rode. I raced him many times at Milton Keynes and I was about the only rider who would go out after a meeting and do starts with him. Thierry's problem was he always seemed to be looking right when turning left and this caused him to usually make 3 corners out of one. I can remember a time when he beat Wiggy at Oxford in a challenge match of some sort and I said to Simon you were quicker why didn't you go round him to which Wiggy replied '' Would you have!!!! ''...Fair comment. Thierry was a friend as well as someone who gave great entertainment and he rode one of my bikes over here in NZ for a summer winning our NZ Grand Prix meeting in 1989." "Good to hear Eric Broadbelt is doing well. When watching Belle Vue from early sixties I was always interested in the middle of the road riders, who on their day could win precious points for thier team,"
"Amalgamate the leagues by all means or level things out. Keep 15 heats and bring back rider of the night format with juniors as well as per the 70's. Stop the doubling / trebling up, why does Charlie Gjedde need to double up, how many years has he ridden EL? Riders with limited experience doubling up is ok, but then the likes of Gjedde, Doyle, Nieminen, Screen etc. should pick a league and stick with it. I think adopting multiple team members that can be interchanged is bad, you won't encourage supporters to come if they can't see the riders they like, however, I do believe EVERY team should be forced to name a No.8 and should a team end up going down to just 5 riders, the number 8 could be called upon to ride at reserve and should have no more than a 4.00 average. Splitting up heat leaders to go around other clubs will not work it will only serve to weaken teams, it should be up to the weaker teams to strengthen not the stronger teams to weaken, if you must bring football into it, would you take the league winners of last season and make them reduce in strength to match the relegated teams ? A 46.00 point limit would allow for greater variety. SCRAP transfer fees, and SCRAP the idea of a Guest just for No.1 and Rider Replacement for everybody else, go back to the old system, Guest for 1, 3 or 5 - top average does not have to ride at No.1, keep R/R for 2 & 4 and lower league guests for 6 or 7 with No.8 given an opportunity at reserve. Does anybody remember Paul Thorp, Mike Wilding, Nigel Sparshot, Linden Warner who all rode for Birmingham in the 80's certainly didn't harm Paul Thorp did it ? or Mitch Shirra started as No.8 for Coventry in the 70's went on to become a heat leader! Play offs need to be adjusted, Poole have done the hard work only to lose at Play Off stage? Instead Poole get crowned League Champions, bottom 2 clubs should play off home and away to stay up, if there is a second division then those top 2 clubs play off home and away to come up, the winners of both matches remain safe, the losers play off for promotion / relegation. ALL clubs should field 3 British Riders, not Tai Woffindens that choose to be British, but Scott Nicholls, Chris Harris, Joe Screen and the likes at least one of which should be a Heat Leader, the other 4 can come from anywhere you like. Oh yea, force the tracks to grade after every 4th heat like they do in the GP instead of letting the tracks get slicker and slicker and slicker through-out the night and spend some money on track covers, limit the rain offs...... GIVE THE FANS A SAY, WITHOUT THE FANS THERE WILL BE NO SPEEDWAY INSTEAD OF TREATING US LIKE WE DONT MATTER, ASK THE FANS WHAT THEY THINK ?????" Relive those classic Friday evenings at 'The Wick' through this new DVD. Hawks and Kestrels stars look back on days gone by in this fascinating step back in time. Pictures of another track in Austria, once again courtesy of Nick Pattison. The Long Eaton end of season celebration evening takes place at Brennans (Regent St, Long Eaton) on 10th November at 7.30pm. There will be a chance to meet the riders and the 2013 management. Admission is £6 on the door, though discounts apply for pre-booking. Contact Clair Cartwright ( 07977 280 175 or clair_louise_mary@hotmail.com ) for further details. "I think you will find that Eric Broadbelt and his wife run a hardware shop in the main street in Padiham, near Burnley. My friend Neil Calvert, a Belle Vue supporter in exile in south-east London, dropped in there a year or so ago when in the area. Eric apparently was only too willing to talk about his experiences at tracks such as Hyde Road, Edinburgh and Poole. My understanding is he got into the business when he retired from the sport." " by Re this comment by Dudley Jones: Grand Prix, etc. "I recognise that there may be financial benefits to the Grand Prix system, but World Championship it isn't. The system only includes a tiny sample of admittedly top riders, but the cost in terms of disruption to domestic racing arrangements and probably loss of support on the terraces, is huge. By all means retain the GP, but run a knock world championship alongside - more interest and more revenue. Call them the GP World Championship and the Knockout World Championship." - Dudley Jones (Ipswich, Mildenhall, hopefully Norwich (and Dudley of course!!) supporter). ::::: My view: This is only looking at things from a British perspective. Speedway's Grand Prix is an international competition under FIM sanction. They look after the majority of federated countries - not just British needs. So, as after as Dudley's comments are concerned - sadly "not a chance of ever going to fruition"." "My Dad dropped off there one Friday night when I was probably 12 years old. We were on holiday at relatives nearby. I was brought up on speedway at Coventry so I had never seen anything like it! I could not believe how small the track was." 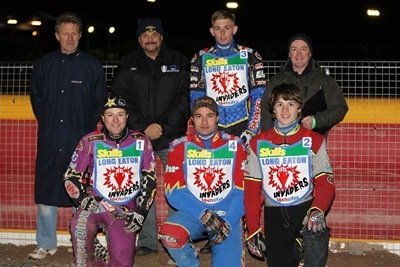 "Both Thierry and Derrol started to come good at MK Knights until injury and mechanical finances scuppered their development which was a shame because both had the guts, grit and determination to challenge even the greatest track specialists. If they was that reckless careers would of been ended fella!" " I have enjoyed reading the comments of folk like Dudley Jones over the last few w eeks as for me they sum up the fact that speedway has lost its mojo and is in very great danger of never recovering it. I don't necessarily go along with everything that has been suggested in recent excellent articles but what is abundantly clear is that there is a need for change, and quickly-sitting on hands and doing nothing is not an option! I have been following speedway for over 45 years now and know what? This year I didn't go to a single meeting. Why? Because I'm bored with it. Same old, same old, and it's getting more expensive every year. I'm bored with the Grand Prix because in essence it's the same bunch of riders being parachuted into a different venue every couple of weeks, much prefer the excitement of a knockout type of competition which gives the chance of an upset and, let's be honest here, the ONLY chance of a British winner in the foreseeable future. I'm bored with the same few teams getting coverage on Sky in front of ever decreasing crowds and at the r isk of sounding like an old fogey (guilty, M'lud) a return to the old 13 heat formula and a second half would at least open up SOME opportunity for younger and junior riders to come through the system. While I grudgingly accept that the new match points system introduced in the last couple of years has worked, speedway is rapidly becoming an Elitist (sorry for the pun) sport enjoyed by those real enthusiasts who can afford it, and on that basis the patient, if not already at the critical stage, will soon be on life support if urgent surgery is not carried out, and I'm not hanging around to watch a favourite relative slowly expire." Dudley Jones shares his vision for the future of the sport. Establishing a series of core values is the key driver behind his proposals. Nick Pattison has sent us these pictures of this Austrian circuit. It looks like the weather wasn't too kind on the day he visited. Congratulations to Chris Holder on clinching the World Title last night. Surely the beginning of a whole new generation of champions? Here's another great picture courtesy of Jim Henry and Bob Andrews. This shows Bob on the right hand side (gate one?) in a picture he captions "The Big Three - Plus One!". Dave Knapkin is looking for Belle Vue programmes from 1956, or BLRC badges - Can You Help? Debbie Brown is looking for info on former rider Fred Chalmers - Can You Help? "I would echo everything said here about Eric Boothroyd as he was the best I can recall around Old Meadowbank, Edinburgh in the 60s. Always hard riding but fair and professional." "Nice bit of research there Nigel, Droylsden is a fascinating venue. The Blackpool venue in 1928 has a similar story attached to it. Although it was originally built as a horse trotting venue, motorcycles were the first to take to the track. This time it was Wilf McClure who rolled the track to resemble an American dirt-track circuit using a mixture of clay and sand. Again. it was an experiment as they even raced clockwise. Keep up the research Nigel, it's never too late to learn something new. " "I enjoyed Nigel Bird's well researched article on Droylsden. What a hazy old venue that is. Amazing to imagine the riders starting at intervals like a time trial. "No passing down the straights lads because they're too narrow!". How speedway has changed since those distant days, but Nigel confirms that this was indeed an officially licenced dirt track meeting. I think that firmly defines it as early speedway. The history of the sport from its earliest faltering beginnings is really being brought out by Researchers nowadays and it certainly makes you think. "